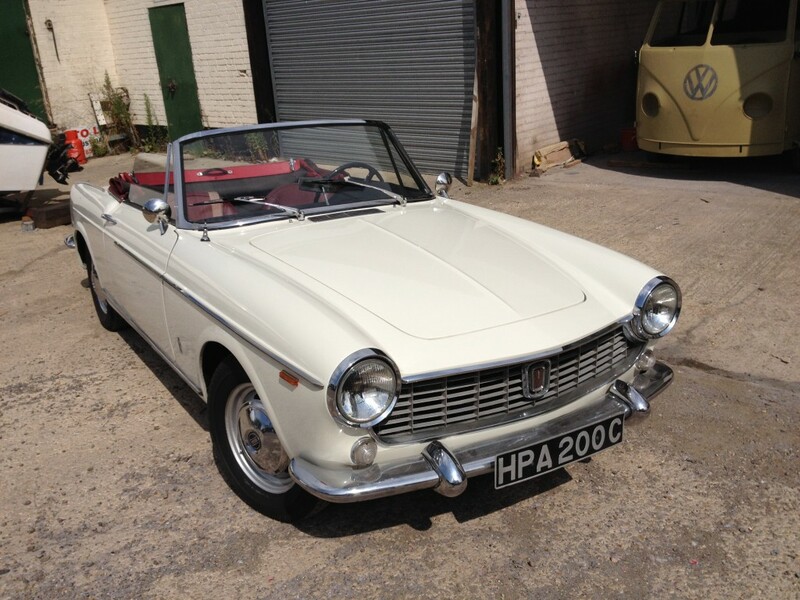 Although I am familiar with the next generation fiat 124 spider this was the first time I had seen one of these late 1950’s 1500 spiders. 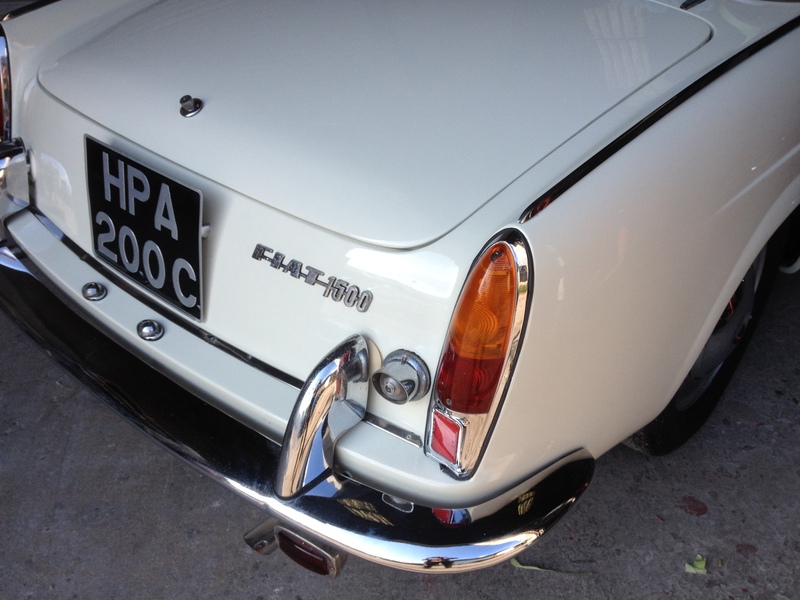 The client sent me details of the car via email and from his description and the photos all looked pretty good. Some light bubbling around the front arches and rear panel combined with an ill fitting door that possibly had been previously filled (badly) and some paint crazing where all that was apparent from looking at the body work. Upon delivery he also commented that the roof was not closing properly and had a tendency to scalp him each time he got in and out of the car and could we rectify this. 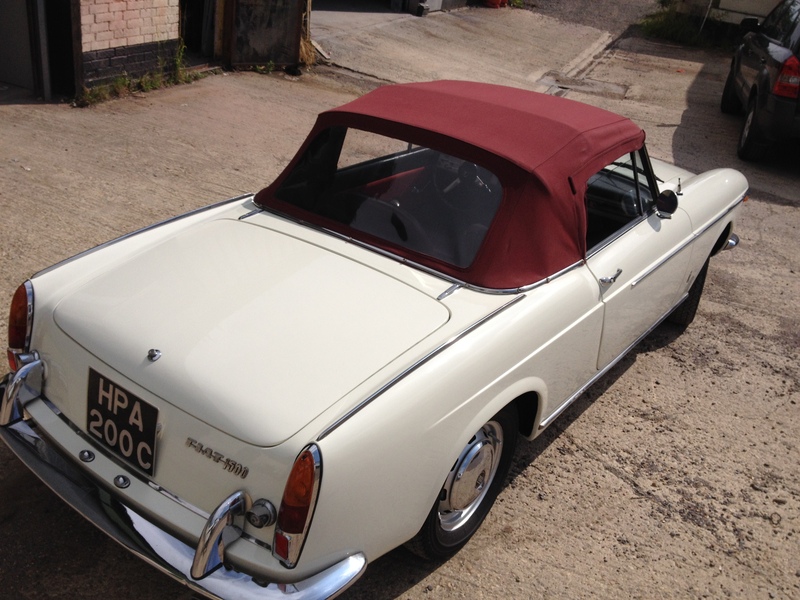 I decided that the fitting problems with the convertible roof should be dealt with first. Initial inspection showed that the material was to short (new roof had been made a few years back) and had been overly stretched to get a tight fit also the horizontal mechanism bars where out of line. 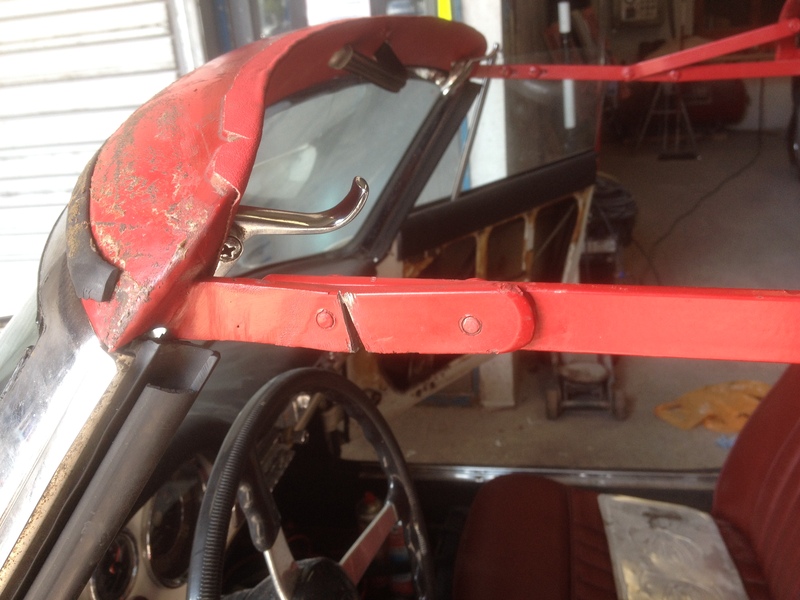 After taking some measurements we first cut the roof mechanism bars and welded them straight to allow the mechanism to reach the fully closed position (horizontal) whilst allowing the front brace to seat correctly against the top of the window frame. The material roof was then stretched back in to position and adjusted to fit before the entire roof was removed to start the main body work. 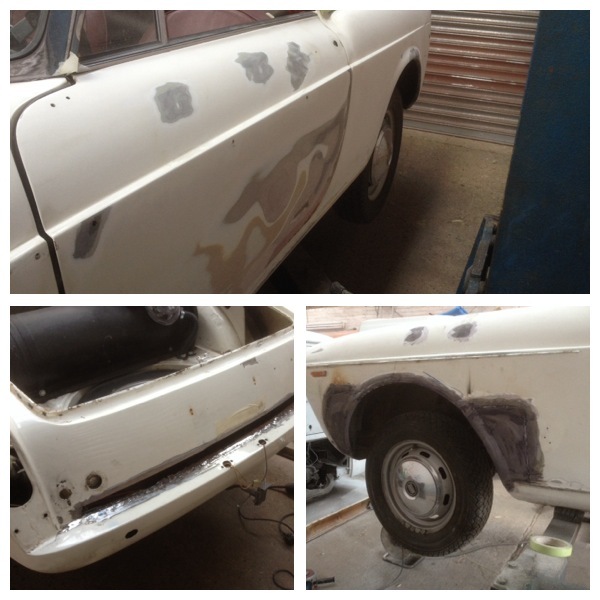 Our next task was the minor bubbling around the wheel arches. Usually this is surface rust or perhaps caused by rusted out holes going through from the inner arch. 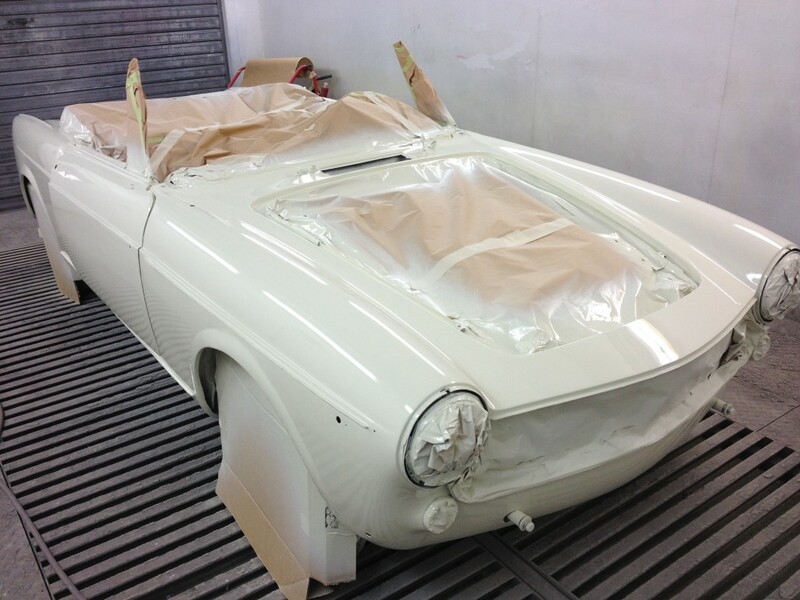 After scurffing the paint away it revealed a mess of previous repairs. At some point in the cars history it had been repaired badly. 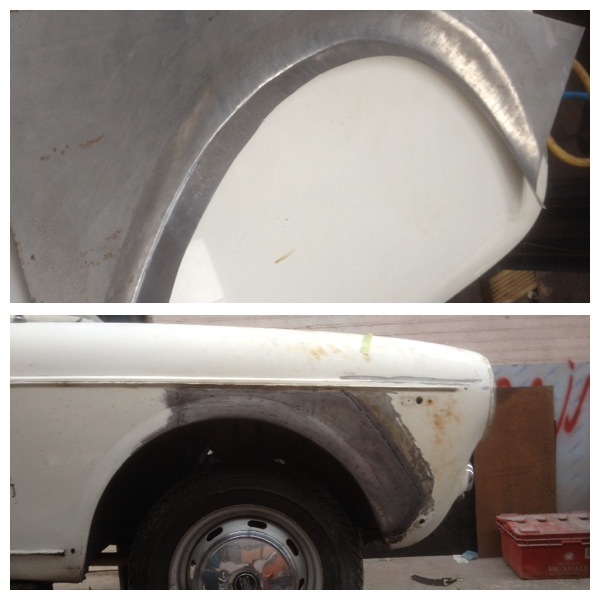 Large sections of the wheel arch had been replaced by pure mig weld with heavy lashings of filler to hide the mess and over time moisture ingress through the gaps in the welds had penetrated the filler to cause the bubbling. Obviously this type of repair is not suitable and replacing the filler and painting over it would have not lasted more than a year before the problem would reappear. Although front wings are available from italy they are very expensive so we decided that it would be more economical to make new steel wheel arches. One of the newly made wheel arch panels. The rear panel also suffered from the same problem. In an ideal situation the rest of the body should have been striped to metal for inspection but clients budget for a vehicle of this value would not allow for the bear metal procedure. As you can see from the photograph above the door was previously over filled with filler. when the door was inspected the reason for the overfill was a badly fabricated and fitted repair lower drivers door repair panel which had also split allowing for moister to penetrate the old repair. Naturally we managed to rectify the old repair and weld the split. the door lost a lot of unnecessary weight and now it’s profile matched the car and fitted correctly. 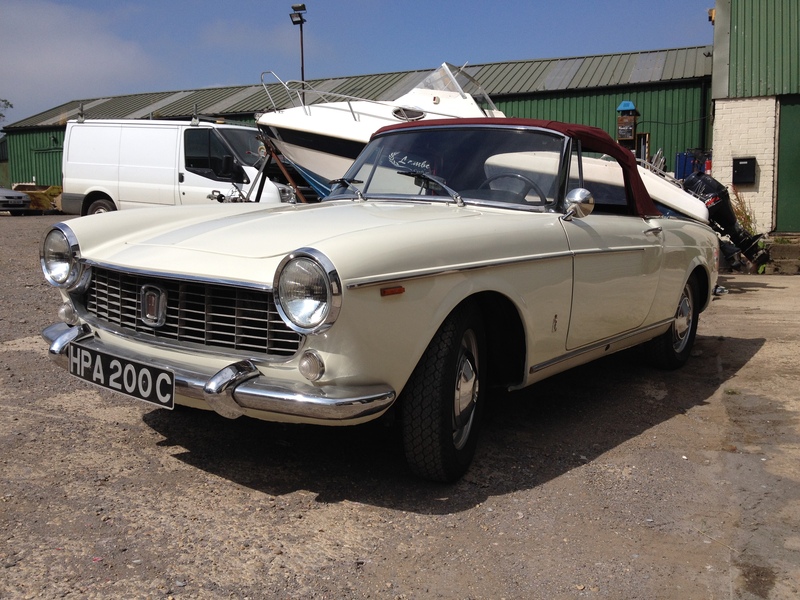 There was considerable other little problems like a gouge in the body caused by a failing bonnet, rot and bubbling around the boot and bonnet panels (again caused by bad previous repairs) plus lots of little chips, cracks and minor dents. 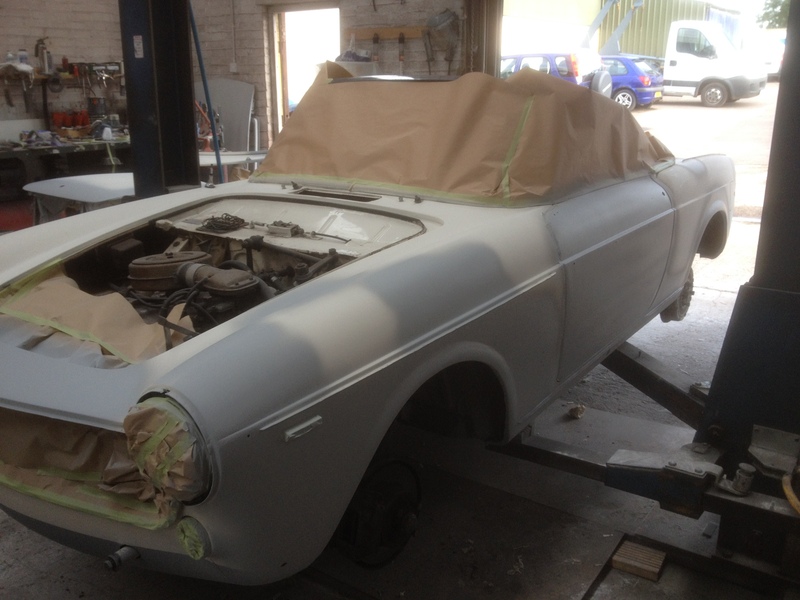 With the main repairs dealt with the rest of the car was sanded and primed in the repaired areas. Now all that was left to do was the refit and some rust protection. 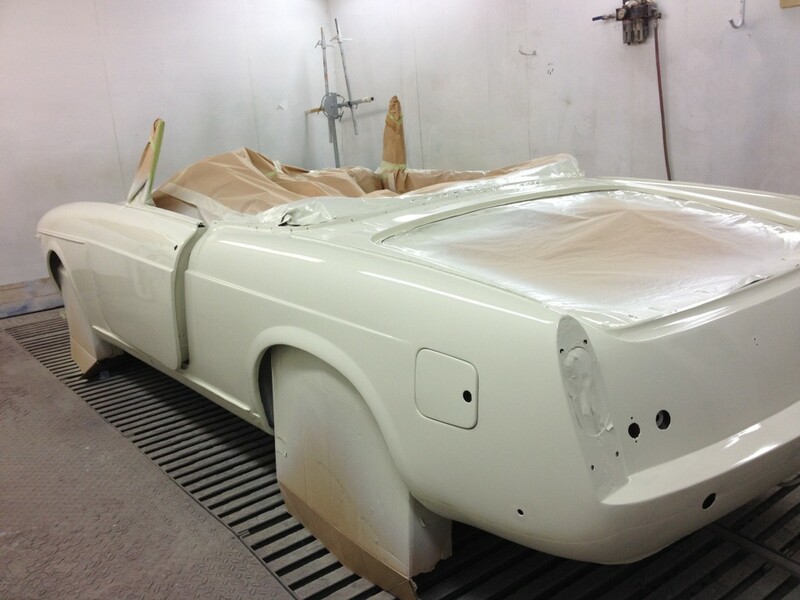 This entry was posted in Paint jobs and tagged fiat restoration, full respray, panel fabrication, restoration by The Paint Shop Pros. Bookmark the permalink.